As a nonprofit, you have a lot of options to build your email list. It’s not enough to implement a generic sign-up form, and it’s important to consider how you’re asking people to sign up as well. No one wakes up in the morning saying “I can’t wait to get more email today.” At least I never have. Your emails should provide value that builds relationships and keeps people in the know about your organization. This needs to translate onto your sign-up form. The verbiage you use should inspire people and entice them to sign up to receive all of the valuable content you send. If you browse almost any nonprofit website, you’ll see that most are basic and simply ask people to “Sign Up for News,” “Join Our Newsletter,” or something similar. Unfortunately, wording like this on your sign-up form isn’t very inspirational. It’s time to stand out from the crowd. Your sign-up form’s headline needs to catch your supporters’ attention and encourage them to get involved in your cause. This first example catches attention because it shows that your organization’s emails will be important and value-packed. It also lets readers know that they’ll receive inspirational stories about the cause they’re fighting for. Many people sign up to help you fight your cause. This phrasing keeps people involved and lets them know they’ll receive information on what’s happening at your organization. Focusing on the subscriber is a great way to let people know that they’ll be a part of the solution and that it can’t happen without them. This one’s fairly simple, but still inspiring nonetheless. It lets people know that they’ll be able to see what’s happening to support the cause when they sign up. This example came from a nonprofit that supports different types of causes. This form allows people to sign up to support and receive information on the causes they care about. Who doesn’t like to feel a part of something? This lets the subscriber know that they’ll be involved in a community of people who are taking a stand for a particular cause. As with the one above, this let’s new subscribers know how many others already support your cause. It gives that “fear of missing out” component so that they are enticed to take action on the cause. When someone signs up, you want them to be an advocate for your organization. This lets them know that they are needed to raise awareness with others. Just another way to ask people to get involved. This serves as a reminder that their support will be helping to better the world around them. This example lets subscribers know that you need their help to support your cause. This example is just another way to let people know that your cause needs their voice in order to make a change. If your organization works with animals or people, your sign-up form can ask people to “adopt” one. This is a great way to let supporters know that they’ll be directly supporting a child or family. I’m sure you’ll all agree these are much more engaging and inspiring than the initial “Join Our Newsletter” example. Use these examples to improve the effectiveness of your online sign-up form. Whether you take verbiage from one or a few of these examples, you’ll be letting people know how to get involved in your cause. You’ve got some great ideas to be inspiring in your form. In addition, you can entice people to sign up with some sort of offer in exchange for their email address. Incentives aren’t just for businesses and provide the credibility that your organization needs to get your supporter’s full attention. You can provide exclusive content for your email subscribers. Use a welcome email or series to fulfill on whatever offer you decide. Use content you already have, it doesn’t have to be a hundred page eBook. Your exclusive content can include information about your cause, how you accomplish your goals, or who you’re helping. Show how valuable your organization is by sharing a story about a client, member or recipient who’s been helped by your organization. It can be a simple, one-page pdf file. Depending on your organization, you may already have a collection of useful information that subscribers would find interesting. Combine it into a helpful toolkit. It could include video tutorials, checklists, and blog posts. If you already offer online workshops or events for your supporters, you can offer a recording for free in order to entice people to sign up for your emails. Start growing your list today! You now have several ways to be inspirational and entice people to sign up to your mailing list. You can use inspirational verbiage in combination with exclusive content. No matter what you do, make sure you’re letting people know that they are subscribing to your email list. You want to let people know exactly what they’re getting when they provide their email address. 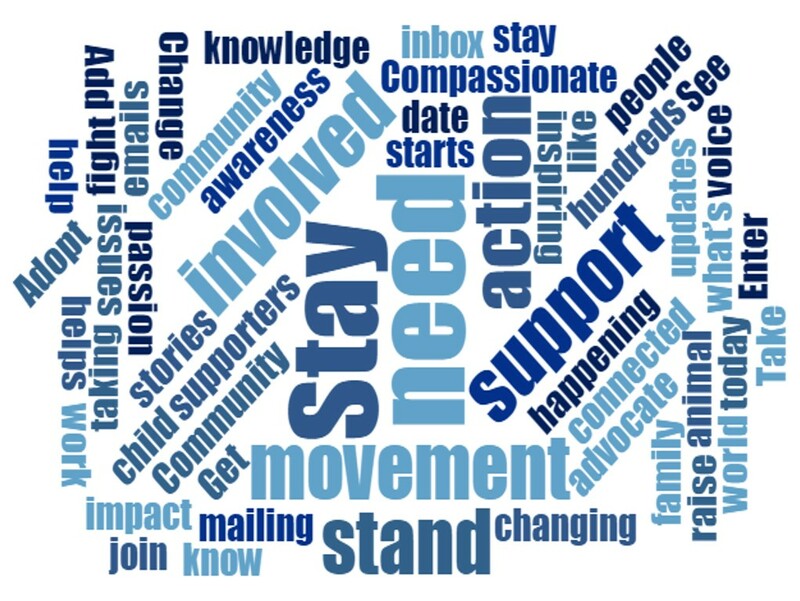 Set up your online sign-up forms or update your existing forms to add the information you need to better inspire people to sign up to support your cause today!